I was 16 and living in Massachusetts when I first saw a real Ouija board in use. I went to my friend's house on a Friday night. His father used to buy us all beer and let us drink in his apartment. His mother was kind of "hippie-ish" and very much into witch craft and things of that nature. My friends and I were all playing Playstation one night and knocking back beers. I had just finished my beer and went to the kitchen to grab another, when I noticed all the lights were off and lit candles on the table. My friend's mother and two other girls (who graduated years before me) were sitting at the table with an Ouija board. This wasn't one of those Milton Bradley boards you buy in a store....this thing looked ancient. It was a huge circle with all the letters, numbers and every spelled out word you could think of. The two girls had their hands on the planchette and my friend's mother had a pad and pen. As I walked by, I snickered to myself and shook my head. I remember one of the girls asking me what was so funny? As I turned to walk back to my friend's room, one of the girls said "Wait...wait! Come here and try this real quick if you think it's so funny". So I did and 8 years later it still creeps me out to talk about it. As soon as I put my hand on this thing, it began whirling around spelling out my first and last name. I was very impressed because neither of these girls knew who I was or at least I didn't think they did. The girls asked who we were speaking with. The board spelled out "T-H-I-S I-S A-J" so I began asking it questions about the future, still in disbelief. It answered all of them, but still...these were future questions that I was asking out loud. Anyone with their hand on this thing could be moving it to make any response they wanted. So I asked the girls "Does this work if I ask a question in my mind?" They told me to concentrate on a question and usually the spirit will answer. So I did. The board spelled out "Y-O-U D-I-E 5-1" I was shocked. One of the girls said "Oh boy...you just asked it when you were gonna die. That's not always a good idea". I asked one final question before ending my session, I asked: "AJ, what is my mother's middle name?" Immediately the board spelled out "J-E-A-N-N-E". I remember taking my hand off and my eyes welling up. That was when I knew right there that it wasn't the girls who were playing some magic trick on me. By this time all my friends were standing behind me laughing. I ran into the other room and sat down. A few came in telling me I had too much to drink, but I know what I saw happen. Several of my friends tried to use it after me, but nothing worked for them so of coarse this led them to believe I was just drunk and making this up in my mind. I was not drunk that night and was in no doubt, in contact with this energy who called himself "AJ". I didn't tell anyone this story for years. Only recently did I tell my mother all about it. I told her how this spirit knew her middle name and my name. When I told her his name was "AJ" she thought for a minute and said "You know, you had a great uncle named Armond Jones, but no one ever called him that. 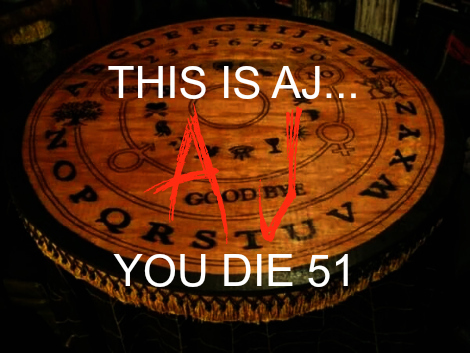 He was always called "AJ". I never knew of this man prior. For a while I dwelled on the whole "Dead at 51" remark, but not so much now because some of the other "future-type" questions I was asking that night didn't come true. Maybe these spirits are just having fun with us. When people say "I never want to touch a Ouija board again"...I concur. Today I would very much like to use a board again, but would be a little more careful with my questions. However I am 25 years old now and most people would call that sort of thing "child's play".